A genuinely friendly reminder from the NYPD. From http://www.nyc.gov/html/nypd/html/crime_prevention/crime_prevention_section.shtml. Okay, gang, it's been a week now. We're hoping that you are finally starting to feel okay about having missed out on the opening-day rush for the latest generation of Apple's cellular telephone. We understand your pain, but who knows, any minute now that producer could get back to you about your screenplay and you could find yourself suddenly rolling in it, in which case there will still be plenty of gold-plated super-skinny phone units left in the world for you to buy to replace your cracked iPhone 3. However, if you are over the iHype but haven't downloaded the new operating system, New York's Finest would like to remind you to get on that. Don't worry, conspiracy theorists, it isn't because getting the upgrade makes it easier for the Fuzz to stalk your instagram. They're trying to save you, and them, some trouble should your phone get stolen. And in a metropolis where the mayor seems to think that crime is on the rise specifically because of iThings, it's probably not a bad idea to pause for a moment to consider the pros and cons when the authorities are advocating for a device upgrade. If you are an armchair tech critic, you may have some strong opinions about iOS7's color scheme, which may have aroused some very dark emotions within you. We hear that's not out of the ordinary, but we'd like you to do your best to momentarily overlook the offending features in light of the fact that the new interface actually clears up a pesky and persistent iPhone issue: the new OS has a security feature called Activation Lock that prevents users from reprogramming or activating a phone on a new carrier without first entering the Apple ID and password associated with the phone in question. Boom. This is a big improvement on the old way of doing business, where the 'find my iPhone' app could easily be rendered useless by any enterprising phone thief. Law enforcement is hoping that the new feature will help dampen the enthusiasm for iPhone theft that some have even gone so far as to call a "Global Apple Crime Wave" (which strikes us as an excellent name for a band that could have opened for Earth Crisis in the '90s). So word, cool, do the upgrade, thanks NYPD. 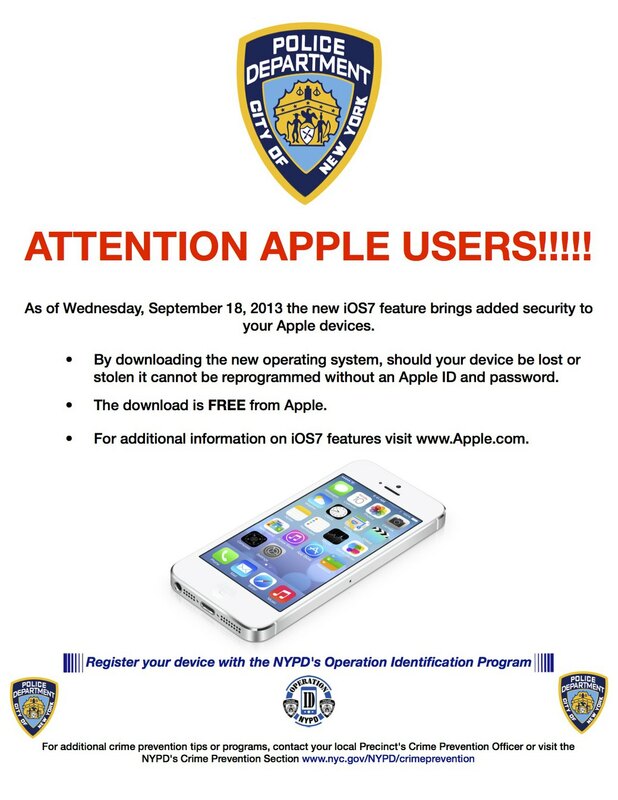 BUT if all this iPhone theft talk has left you feeling kind of vulnerable and you're interested in other phone security options, the Boys in Blue have another public service announcement you might want to hear. Ray Kelly and company run a free program called Operation ID: you bring them your portable valuables, they engrave them with a serial number, and if anything you've registered ever gets stolen they can easily get it back to you. We're guessing that the inclusion of fax machines on the list of portable valuables in the official description of the program means that it's been in place for a while. (Also, can anyone who was born before the year 1990 tell us what the woman in that picture is holding? We're guessing it's some kind of tape deck, but it's also possible that we are just too enthused about how vastly different tech used to be andddd maybe it's just an iPad. Add your guesses in the comments below! That page also includes a great pic of Giuliani (remember Giuliani?) mugging with one Officer McGruff, so maybe that page hasn't been updated in a decade or so, unless Bloomberg has some kind of aversion to posing with mascots. ....Oh wait, he doesn't. Hi, Birdie! And as a final note on the subjects of cops and iPhones, we have an app recommendation for you. Since we live in a neighborhood where Stop and Frisks are all too common, check out the New York Civil Liberties Union's Stop and Frisk reporting app. It records audio and video at the press of a button; when you've stopped the recording you're prompted to fill out a questionnaire about what you just witnessed or experienced, and a popup page contains a list of your rights as they pertain to the situation. Because it's never bad to advocate for accountability, iOS7 upgrade or no. So that's that. Take care of your Nice Things! !